China will soon be, if not already, one of the greatest commercial opportunities for enterprises in the renewable energy and energy efficiency business. Demand for electricity is rising at 15% a year [R1]. China is projected to need 9 times the energy generation capacity of the United States within the next decade [R1]. China is committed to 15% of electrical power being from renewable sources by 2020 [R2] and the Chinese Premier has pledged that China will reduce its carbon intensity by 40-45% by 2020 from 2005 levels [R3]. In another post I discuss the amazing growth in renewable energy technology patent filings. It is estimated that China will need to invest around US$400 billion to realise these targets [R4]. Much of this investment will be in wind [R5] but other technologies will also attract strong investment. Because Chinese coal reserves are estimated to run out in 50 years [R4], and currently the lions shares of electrical power is from coal fired generation, this investment is just the start of much bigger things. 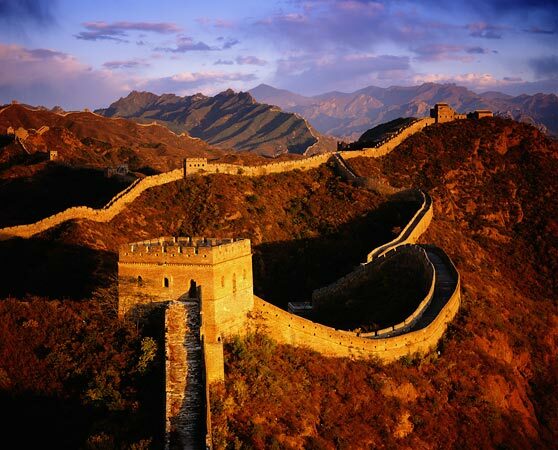 Will renewable energy in China follow the great wall in ambition and scale? Foreign companies and investors are taking advantage of the opportunity. For wind turbine manufacturers such as India’s Suzlon and US-owned GE, China is a very important, if not the biggest market [R6, R7]. Denmark’s Vestas has acknowledged this opportunity and built the world’s biggest wind turbine manufacturing complex in China [R1, R8]. Siemens is likewise manufacturing wind turbines in China [R9]. FirstSolar, an Arizona based solar company that manufactures solar modules, recently won a contract to build a 2 gigawatt solar field in China [R10]. The competition from local companies is very strong. China’s manufacturing strength is great and it can turn out a product at a highly competitive price for export. China now manufactures more solar panels and wind turbines than any other nation [R11, R1, R12]. Local wind turbine manufacturers include Sinovel and Goldwind, and solar photovoltaic (PV) manufacturers include Suntech and Trina Solar. As local competition moves from me-too manufacturers towards technology leaders, intellectual property (IP), and particularly registered IP, is going to become even more important to foreigners operating in China. That foreigners are now successfully competing in China against such strong local competition may be attributed, at least in part, to the valuable IP embodied in their technology. Keeping this IP out of the hands of competition or at least licensing this technology to them for commercial gain, is paramount. China is often considered to be, at best, ambivalent towards IP protection. There are plenty of anecdotes about new imported technologies being rapidly copied by counterfeiters, aided by what many consider a weak Chinese IP system. This view is no longer representative of the experience many foreign companies have in China. China’s formal IP patent system has dramatically improved in recent years. Foreign companies operating in China have also worked out strategies that operate outside the patent system to largely secure their IP. In fact, eSOLAR is so confident that their IP – both patents and know how – are secure in China that they have entered in joint venture (JV) agreement with Shandong Penglai Electrical Power Equipment Manufacturing Company. eSOLAR brings their IP to the JV and Shandong Penglai will manufacture the components. Any new IP developed during the course of the JV will be shared [R3]. The JV plans are ambitious – 2 gigawatts of solar electric power by 2020. The power of IP in China is well demonstrated by the licensing of patented DVD technology and the DVD trademark and brand to Chinese manufacturers. In this case, the licensee is the DVD6C Licensing Group comprising Hitachi, JVC, Panasonic, Mitsubishi, Sanyo, Sharp, Toshiba, Warner Home Video and Samsung – none of which are based in China. The licensing fees appear to be around US$15-US$20 per DVD capable unit, which is a significant fraction of the final price [R22]. The IP around DVDs appear to be strongly and successfully enforced in China by the DVD6C Group. The official Chinese position on IP protection often depends on who you ask and where. The central government, at least, has the policy we should intensify IP protection, and amplify the system for IP protection [R14]. This is great news for those filing patents in China now as the enforceability of the patents is likely to rise further over the coming years. China now has a rapidly developing, and often effective, administrative and judicial system for enforcing IP rights. Meanwhile, Chinese companies are steadily increasing their share of patent filings. According to statistics from the World Intellectual Property Organisation, China is currently ranked 5th in the leading nations that file international patent applications. Foreign companies like Toyota are also dramatically increasing their IP presence in China. Toyota increased their registered design applications by around 300% over the last decade to around 250 applications per year [R16]. They are “deeply impressed” by recent court rulings [R17]. Siemens is also strongly increasing its patent portfolio in China [R18]. Foreign companies are investing heavily in IP in China. Chinese cleantech companies are also investing heavily in IP. These include Suntech, a manufacturer of solar cells, and BYD, a manufacturer of lithium ion batteries and electric cars. Companies operating in China need to consider their IP and enforcement strategies very carefully. Some courts and administrative bodies are more IP literate and considerate of IP rights than others [R19]. Choosing the right venue may determine the outcome a patent holder desires. For example, the provinces of Pudong (Shanghai), Xian, and Wuhan have experienced IP Courts [R20] which may provide a more reasonable outcome. Interestingly, China has two systems that receive and consider IP related complaints. The judicial system offers pre-trial injunctions, permanent injunctions and damages. There is also an administrative system which is very fast and requires little preparation of evidence. The administrative authorities will usually carry out a raid action within hours of the complaint being filed, issuing in effect stop orders and fines [R21]. • registering copyright, especially for new media and logo copyright. It is also a good idea for employees and business partners complete an IP protection agreement [R21]. Non‑compete and confidentiality agreements signed by employees and partners can be effective as China has trade secret laws that have been effectively used. As IP is a relatively new idea in China, educating employees is important. It is not uncommon to find that a local JV partner has entered into a JV purely to extract IP from a foreign party for use in its own operations [R21]. Clearly, JV’s must be entered into with open eyes, strong IP management strategies, and an agreement in place. Regular searching of official patent and related databases, to check your partners are not misappropriating technology, can be a first step in preventing this type of IP leakage. The opportunities in China for energy technology enterprises, particularly those involved in renewable energy technology, are immense. However, a careful consideration of IP strategy is required, and strong IP protection is essential to effectively compete against the local competition. The formal IP system and IP enforcement in China have greatly improved over recent years and can now offer effective protection. Nevertheless, implementing IP strategies that operate outside of the formal registered-rights systems is very wise. R22 Redfearn, N., “Patent Pools in China”, Intellectual Asset Management September/October 2009, pgs 102-105.